It takes teamwork. I have to say, when the switch was made from human-powered travel on Dark Ice to instead learning the art of driving dogs from the best in the business, I was into unfamiliar territory. Having driven other people's dogs only a handful of times, the four of us would need to improve fast and be able to, after barely four months, emulate at least some of the simply staggering ability hunters have here to control and motivate their dogs. Sleds and dogs, five for a small 'racing car' sled and a dozen or more for a load-carrier, are the intercity trains here as well as the local runabout. The thing is, these particular engines have a mind of their own and make it well known! When I say teamwork, I'm not talking about James, Anders and myself (Anastasia is temporarily back in London to comply with bureaucratic rules.....she's back here in a few weeks), not this time anyhow. Whilst the importance of the relationship between us, the drivers, and the dogs, the engineroom, is not surprising, it was proven to us over the last few days. These animals have the most extraordinary range of personalities – from the irrepressible unguided missile that is Jack, to the rumble of thunder Thor, to Phoenix who is a bit of a wimp and to O.J. who is a certifiable pain in the... The trick is to foster confidence in the dogs and earn their trust, whilst being strict when breaking up squabbles and making it clear who is boss. Some hunters are tough on their dogs and others employ a different tactic. One friend of ours, who has taken to calling me kammak (meaning friend, the comic subtlety of which I'll leave unwritten!) at every opportunity, Peter, is a descendent of the earliest Kap York ancestors of the latest migration of Inuit from the west hundreds of years ago. Another local said of Peter, 'his dogs love him. They would do anything for him'. The end result of this is blindingly obvious – two of our dogs are from Peter and they are probably the friendliest, keenest and healthiest we have. We had found a path to follow. Our training has been ramping up over the past weeks and single day sessions with the sleds and two teams have been the starting point. Extended journeys are of course critical and our first foray began on Tuesday. Using the second of the teams, which we felt were the most ready, our target was this time not Qeqertat (check out the previous post for our man-haul journey there) but Siorapaluk. Around 50km as the crow flies and nearly 60km as the land forces the route to be, Siorapaluk is another small hunting outpost and is home to around sixty. It is two headlands to the north-west of Qaanaaq and across large tracts of sea ice. We set off as the glow in the sky, growing everyday as we approach the spring at the end of next month, had started to show itself. Clattering around over the tide crack and initial broken ice offshore, we had the three of us, supplies for the journey and a few 'extras' to get the weight up – this was training after all. At around half a metric ton including us, it was the benchmark we needed to measure our progress at. The route west took us between Herbert Island (island is amusingly for me at least, is pronounced 'errgh') and the snowy slopes of the mainland. Glacier tongues ran down valleys and we could for the first time see the area we would have trudged with 300kg loads a month previously had the ice hundreds of miles north been better. 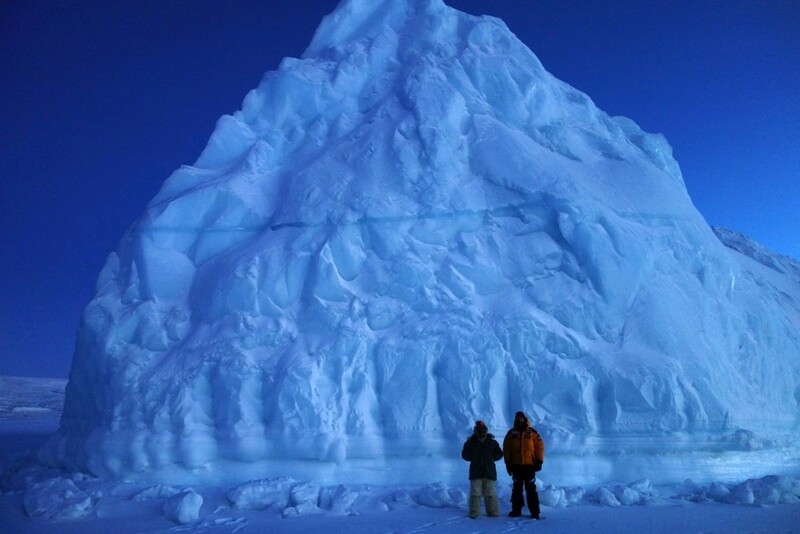 The first headland was, as we were told, quite spectacularly steep and before the sea ice had consolidated, the 'ice foot' around the corner would have been eye-watering with a ten foot drop into the water. 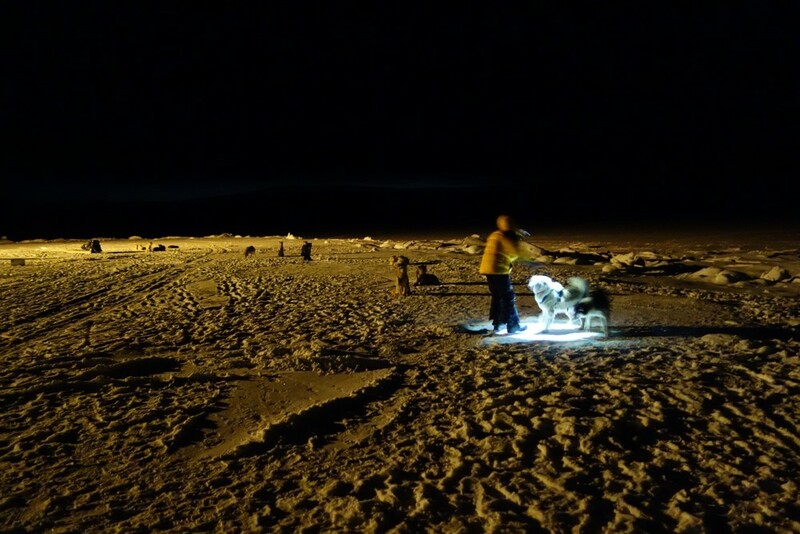 Residents of Siorapaluk and Qaanaaq had been heading back and forth since just before New Year, after the bad ice had frozen up, so sled tracks made the route-finding a non-issue. The first trick with a new dog team is to get them to move in the same direction as one another. The next is to get them to go in a particular direction using cues, either a track in the snow or a skier out ahead. The final one, a job we're still working on, is to use voice commands and a whip to make a crack either side of the team, directing them. The light began to fade as we rounded the final headland (one of the famous Greenlandic never-ending headlands) and we had been making only 5 or 6 km per hour so far. We were still a couple of hours from our destination at 8pm and we finally saw the few twinkling lights of the settlement beckoning us in. Despite no-one there knowing we were coming, kind locals flashed lights (as they did in Qeqertat) to guide us in. 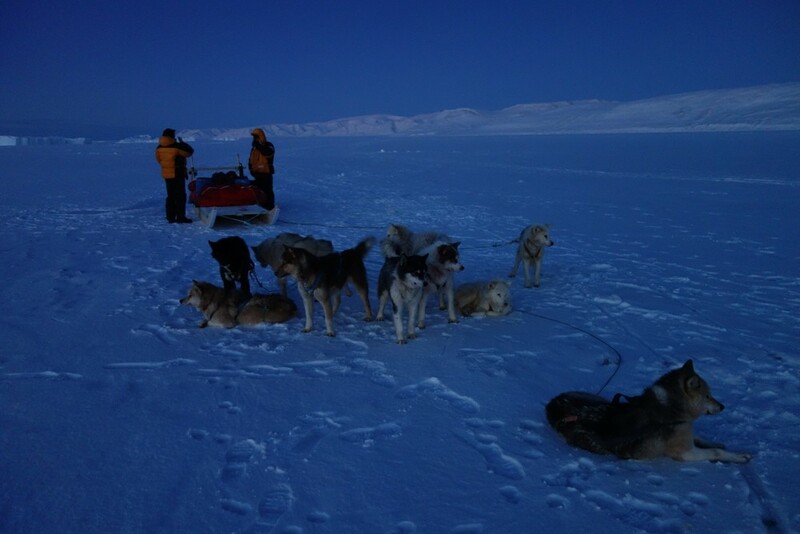 The dogs were becoming tired and we were usually working with one to walk ahead, one issuing commands from the sled and one walking/pushing from behind the sled. It is certainly not a case of climbing on, getting comfortable and typing in your desired destination – which is to be honest something to be thankful for. Keeping warm is however the main challenge as opposed to keeping dry, as is the case when man-hauling. Siorapaluk's tiny population came out at past 10pm to give us a warm welcome, offer us prime staking points for our dogs, coffee in their home and a disused house to sleep in. To my surprise, as we neared the shoreline and before I could make out any faces in the dark, the word, 'kammak!!' rang out across the ice. Peter was here, unbeknownst to us, visiting family. Bright and early the next morning we set back out for home. The dogs seemed a little reluctant after their initial enthusiasm and we knew their fitness, as well as our own experience, needed to improve. It was training after all and nearly sixty kilometres lay ahead in temperatures in the mid-minus twenties. Peter was also headed home with a tiny sled and seven dogs. We soon decided to travel together, us lightening our sled as we rode one at a time with him and the other two driving/pushing our sled. Every few miles Peter would stop and wait, ever cheerful and dressed head to toe in seal skin and polar bear fur clothing. Our modern Pertex and wool fared no worse but it had to be said he had the 'look' pretty sorted! The miles ticked by and before 7pm (notice the improvement?) two sleds, three visitors and one diminutive dog magician rolled into Qaanaaq, ready for food, but not before feeding our twenty dogs. Each of us were in awe of the calm, quiet skill Peter had. Barely ever shouting, as we were having to do, he melodically spoke to his dogs, using the whip to get their attention only once in a while. The final hours saw Peter and I chuckling away at his jokes, him puffing away on a cigarette and me catching glimpses of the northern lights to the south.